White supremacy. Patriarchy. These are hard words to hear fully, even more difficult forces to challenge, and yet we cannot be the Unitarian Universalist faith that we want to be without confronting them. Our liberal religious tradition — proud, historic, vibrant, ever-evolving, and deeply flawed — is right now wrestling with the roots of white supremacy and patriarchy in our faith. On that, our tradition is surely not alone. Yet the power of our faith’s principles also calls each of us, and particularly those who are religious leaders and those who identify as white, to not flinch from that reality. In this time in the United States, we can only be a beacon for hope and justice if we demonstrate the integrity of our principles through our actions. Inspired by our friends in the UUA Youth and Young Adult Ministry office, our team wants to tell you the ways we have fallen short of this integrity so that we can act differently in the future. Our team is three Unitarian Universalists – two people of color: one man who is the staff supervisor, and one woman who is a religious educator; and one white woman who is an ordained minister. We help Unitarian Universalists build new relationships with people, and make it as easy possible to share the gifts of our faith in the wider world. 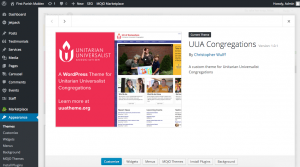 Some of our jobs include overseeing the content and design of UUA.org, curating the site’s WorshipWeb section, editing the weekly Braver/Wiser message, managing creative and digital strategies at the UUA, leading workshops and trainings for congregational leaders through our Outreach Revolution network, and publishing this blog. In many ways, we are responsible for defining the face of Unitarian Universalism. 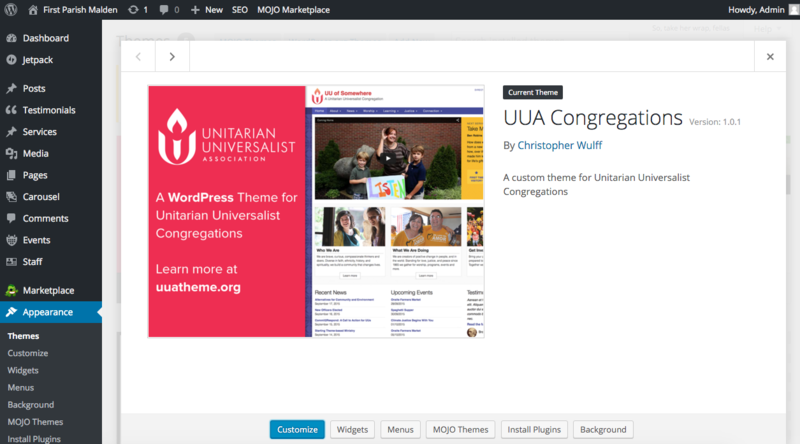 Who do you see when you land on the UUA homepage? What text do you read? What information do you encounter? We try to balance the reality of who we are as UU’s – older, whiter, more liberal and more educated than our neighbors – with our aspiration for who we want to be – multicultural, multigenerational faith communities. We neither want to whitewash the diversity we do have, nor do we want to fall into the “college brochure” trap of showcasing a diversity that exists only in our fantasies. We know we get this balance wrong sometimes. We’d like to hear from you when we do. But more importantly, we have been making these decisions in a vacuum, relying on our own best judgement. In the future, we commit to working in ways to do this more honestly, openly, and accountably. WorshipWeb and Braver/Wiser are widely-used tools for planning worshipful spaces, and we can and will do more to use them to de-center whiteness in Unitarian Universalist worship life, lifting up the voices of people of color and reconsidering our basic assumptions about what feels most spiritual and profound. We describe our work as helping Unitarian Universalists build relationships with new audiences, to help our saving message reach more people. We are careful to say that, yes, this relationship does not necessarily translate into membership, that it may take place outside your congregation, and that we can do ministry at many levels no matter who we are. But the truth is that we have also allowed the UU’s we train and advise to believe that, really, it’s about getting more members on the books and more pledges in the bank. 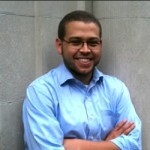 We need more of “them” to join “us,” more brown and young people in the pews. We as a team sidestep this assumption which separates “us” and “them” even before we welcome newcomers through our doors. We allow it to persist, choosing to believe in good intentions rather than leaning into our discomfort and the higher calling of our covenants. We have avoided interrupting conversations that perpetuate both conscious and unconscious beliefs in the white experience as primary, normative, “better than,” and dominant (just look at the title of this blog). Our churches often hide the best parts of our faith inside our congregations, and use it as a lure to become a member. We do this knowing that, as a predominantly and culturally white faith, people of color must make ourselves uncomfortable and endure our own marginalization to access the Unitarian Universalist spiritual wellspring. The UU need to grow, to prove our value by claiming others, can be traced to a Puritanical, colonial impulse to control. Do we have the spiritual strength to give away the best that we have? 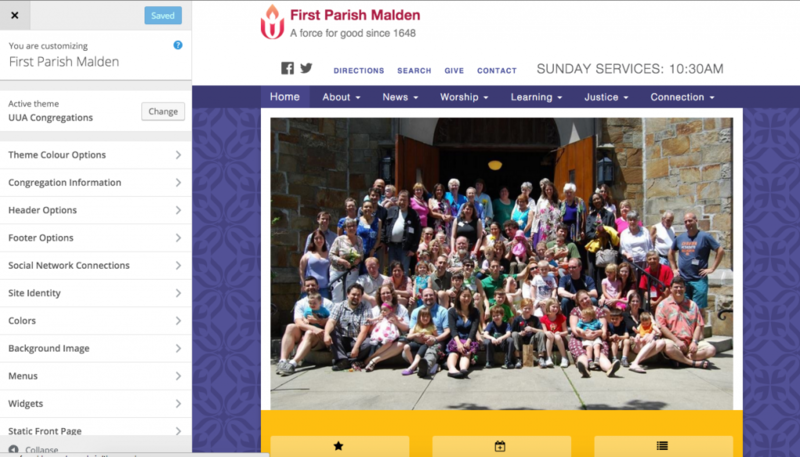 At the recent Black Lives of Unitarian Universalism gathering, all main events were livestreamed for everyone. How many UU spaces and congregations would be willing to do the same? How many would be able to liberate their principles from the membership growth mindset? We as the outreach team have failed to bring this multicultural strength and value forward, fearing being seen as “too radical” or feeling that such changes were beyond the realm of possibility. We can and will name this truth in our work going forward. Who do we serve: our mission and our principles, or our institutions? This is not an intellectual exercise for our team. It is physical and emotional and visceral, and our livelihoods are connected to it. When we whitespeak to pass as educated, competent and respectable, and center white audiences in our writing, we are not living up to our calling. And we say now, publicly, that we are committed to doing better, because we believe our faith depends on it. We applaud and support the work Black Lives of Unitarian Universalism (BLUU) and Diverse & Revolutionary Unitarian Universalist Multicultural Ministries (DRUUMM) are doing for our collective liberation. We urge you to support the #UUWhiteSupremacyTeachIn by signing up here and donating to BLUU and DRUUMM. What if this moment, this time in American history, is the reason we’re here as Unitarian Universalists? That’s the thought that popped into my head with the dawn of 2017, on the heels of a very rough 2016. Religious leaders have been put on notice by the decline in church attendance and the rise of the “spiritual but not religious,” yet in many ways our engagement with these trends as Unitarian Universalists has been about us – what we want, what we hope for, what we feel. Right now, the world needs us in a different way, as the fear-filled national election and the incoming administration’s political agenda are sure to demonstrate. It’s why attendance has spiked at UU congregations across the country. We have to push outside the four walls of our congregation because the call to ministry has never been stronger, and it’s happening in the streets. I, for one, feel that this call to action has started to, er, trump our other ideas about the future. Over the last few years we’ve also started waking up our activism with the movements for black lives, immigration reform and gender equity. And now it’s time to level up. Resist the pressure to normalize the Trump administration’s agenda and the way it will target people of color, queer people, women, and anyone with minority status. The whole world will be paying attention, and it matters that we as a denomination with historic stature begin to resist this agenda. Proclaim your values from the rooftops. People are starting to hear us, so don’t stop now. With this month’s Outreach Revolution virtual care package, you can download four customizable images to promote the themes of 30 Days of Love. Share them on your personal or congregational Facebook page to show what relationship, covenant, transformation and sustenance mean to UUs who join social movements. Have you reached out to your community partner groups? Interfaith groups and neighbor churches? You’re going to need one another for what’s coming next. You may even need to reach out to each other as members within your congregation, to break down some silos and just make sure your fellow congregants are doing ok. Who in your community will be on the frontline of harassment from the Trump administration and its allies? You may be targeted, or you may know others who will, but in either case you will need friends in a whole new way. Be out in public this week. Follow the Week of Action links to find an event near you, or maybe you already know of one! Wear t-shirts, carry banners, find a way to express your hopes and fears for the country, your community and the world. Help people who are reconnecting with your community get plugged into these actions. Remember, we need to show the love, not just say the love. Keep it up, there will be plenty of opportunities and needs. 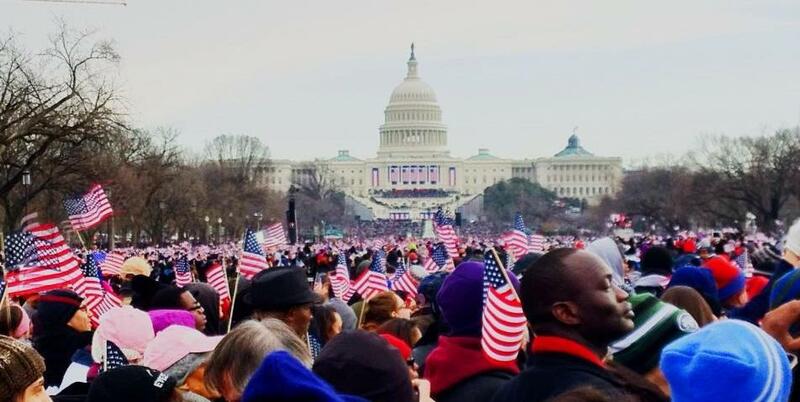 For all the people who you turn out for the Week of Action and 30 Days of Love, have a next event ready in the coming weeks or months that you can invite them to. Get in that “next ask”! Show your involvement during the Week of Action isn’t a one-off event. 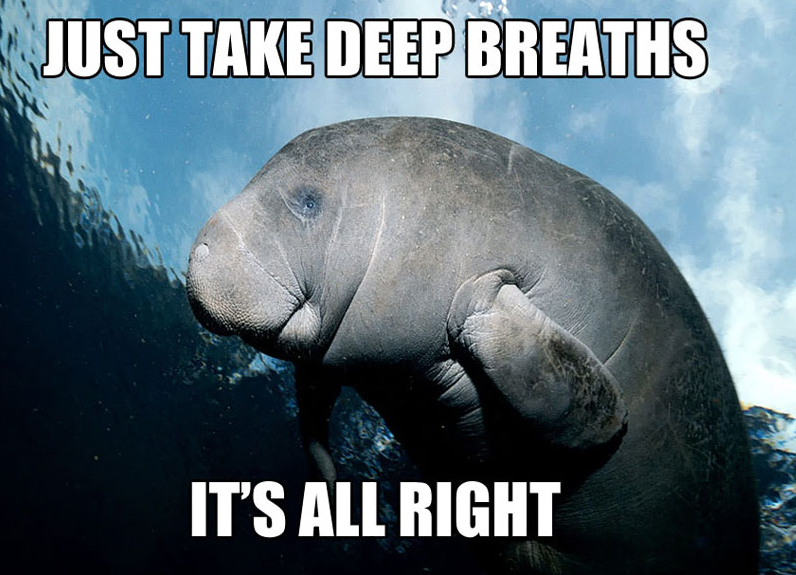 Stay strong, friends. We’re headed towards tougher times, things will get worse. But maybe that’s what we’re here for, and the calling of our times will help us as UU’s become who we were meant to be. As nonprofits, religious organizations are allowed to talk about political issues and needs,* so let’s make the most of it! I believe that if we answer this call, it will lead us to the purposeful and faithful future we’ve hoped for. We’re just getting started. *See the UUA’s Real Rules for more information on the actual limits of political activity by religious nonprofits. You may be surprised how much we can do! Don’t panic, dedicated UU leader! Hopefully, you already know there are lots of guides, curricula, videos, templates, tools and resources to help you do better outreach, available through the UUA at uua.org/outreach. But for most congregational leaders I know, especially volunteer leaders, it’s a lot to digest. 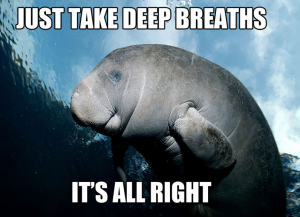 Integrating social science research, theological reflection, event planning and Facebook posting into a single overarching strategy is a lot of work when you’re just trying to keep things running week to week. I totally understand. 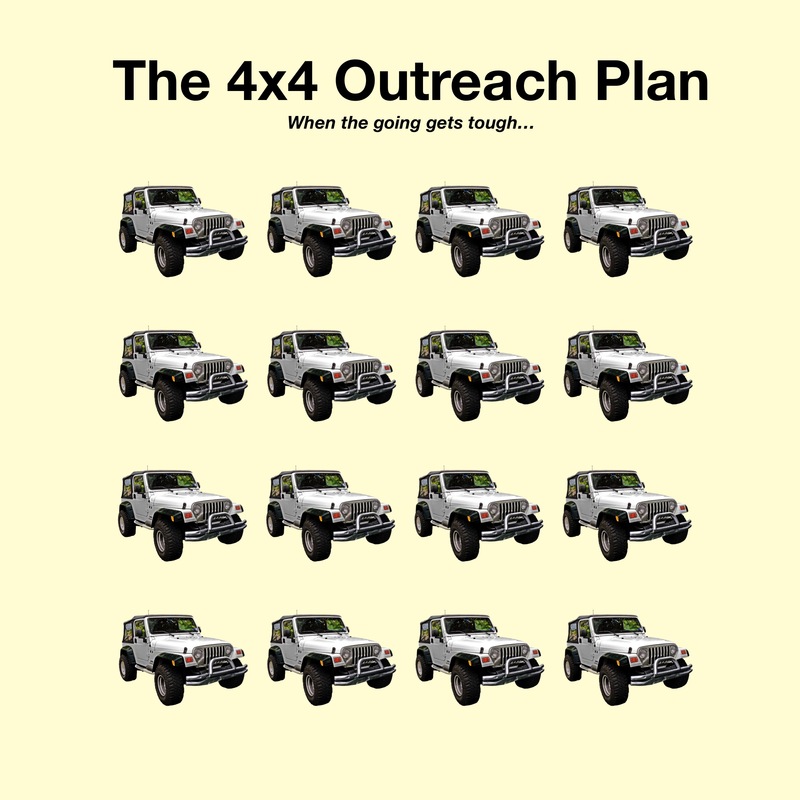 So we’ve created the 4×4 plan for outreach in your congregation. The 4×4 Plan is a simple, easy and low-cost way to help your community connect with your congregation, integrating all those tips and suggestions into four basic steps. 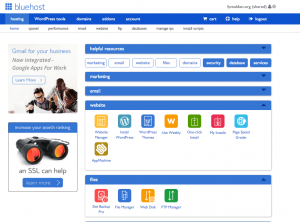 If you don’t know where to start with outreach, start here! Conversations – Talk to four people in your community (other faith leaders, community leaders, friends, local business owners, etc.) to get some feedback about your congregation. Take them to coffee, ask them what do they know about your congregation? What niche could you help fill in the community? This is the beginning of mapping user experiences, it will give you a valuable outside perspective, and it helps build your network in the neighborhood. Opportunities – Offer four “entry point” opportunities for people to get to know your congregation. Typically not on Sunday morning, entry points can be events, programs, speakers, concerts, forums, book clubs, play dates or classes. 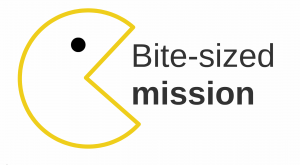 Make sure they connect to your congregation’s mission, and they pass the “friend test” – you’d be willing to invite your non-UU friend. Content – Create four pieces of original content which can be shared online that relate the life and mission of your congregation to something going on the world. Write a letter to the editor or a blog post, create a shareable holiday image or a short video, put up a piece of art on your front lawn and tell the world on social media. Get creative! Make it something you are excited to share. Promotion – For each of those opportunities and content pieces, promote them in four different ways. Example – for a community workshop for parents, you could email info to community partner groups, boost a Facebook post for $10, put up flyers at local day care centers and coffee shops, and add it to your local weekly newspaper’s calendar. 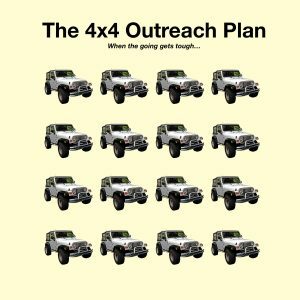 Now, while I can’t guarantee that using the 4×4 will instantly generate a flood of new members for your congregation, I can promise you will learn a great deal about how to reach out and make new connections in your community. Give it a try! And if you do, be sure to let us know how it goes in the comments section below. Or email us at outreach@uua.org, we’d love to add a postscript to this post with some stories. I bet your congregation changes lives. That’s why you keep coming back, right? So if it’s true that your congregation has something amazing to offer, how do people get to know about it, and how do they get connected? We know how people find out about Unitarian Universalism. They stumble across our awesome websites, they see our fabulous blog posts, they hear about our justice work in the news. Every day, I help congregations use social media, branding and other communications tools to reach new audiences. But once those new people find out about you, what happens next? How do you translate that awareness into longer-term engagement? Entry points are a great way to introduce your congregation to new people and help them learn how to get involved. 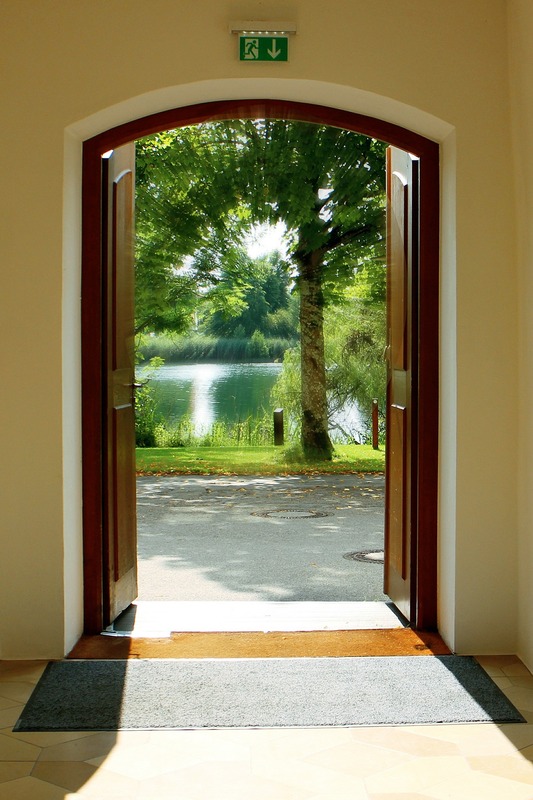 Think of an entry point as doorway into the life of your congregation. In the past, simply inviting someone to visit next Sunday might have been enough. But today, as Americans are becoming less religious, we need more ways to connect with our community that don’t feel so church-y up front. Give folks a chance to see what your congregation has to offer before they take what can feel like a big step – showing up for Sunday services. Bite-sized mission – Entry point opportunities should be explicitly connected to the life and purpose of your congregation. Lots of churches host yoga classes, day care programs and recovery groups, and those are all really important. But if you can’t say clearly WHY an event is a core part of your congregation’s mission, then it doesn’t work as a true entry point, and it’s just a nice but unrelated event. Pass the “Friend Test” – Would you invite your friend who is not a UU? If not, your entry point opportunity has failed the “Friend Test.” Your entry point could be too insider-y (the weekly Women’s Circle that’s met for the past 20 years) or too high commitment (a ten-week adult faith development class). You want someone who is not currently “church shopping” to feel excited to come. Probably not Sunday morning – Though most congregations have a welcome script during Sunday worship services, the focus on visitors often stops there. For visitors, going to religious education classes can be confusing, coffee hour can be clique-y, and joys & concerns can run long. So it’s usually better to create entry points where the visitor experience is central to the design and planning (and they don’t even have to be in your building, like doing a park cleanup!). Special Sundays can be decent entry points, like an all-ages holiday service, if they are planned and advertised well. Once you’ve got an entry point planned, promote the heck out of it! Whenever I talk to congregations that are planning to spend money on advertising or direct mail, (and I hope more do!) I always tell them to include an invitation to an entry point event. This gives you a reason to reach out, a call to action, instead of just saying “hey, we exist!” At the UUA, we’re actually working on a promotional toolkit for congregations, hopefully to be released fall 2016, so stay tuned. Remember, entry points can be really valuable for current members as well. All these examples listed here involved members of the host congregation. If you think about the Spectrum of Faithful Relationship, events and activities planned for folks on the left side of the spectrum (your fans and friends) can appeal to those on the right side (your core members and leaders). But it doesn’t work the other way around; events planned for congregational leaders have a much narrower audience. My final piece of advice for congregations planning entry point opportunities – always have a “next ask,” or an upcoming event you can invite people to. This gives you a reason to collect email addresses and follow up with attendees, one of the best ways to build trust and engagement. Make sure your follow-up event is connected to the theme your entry point event, which shows that you take your congregation’s mission seriously. For example, if you do a panel on the tiny house movement, then do a tiny house tour two months later (good job, UU Fellowship of Redwood City!). So get out there, start scheduling entry point opportunities! Get the word out, have fun, and collect some email addresses. Got great ideas for entry points from reading this post? Add them to the comments below. As Unitarian Universalists, we have a traditionally operated under a model of church that doesn’t acknowledge the changing social norms about religion. Historically, we’ve only kept track of one aspect of involvement in church life, “membership”, which typically means signing a congregation’s membership book and making an annual pledge. But in reality, people interact with faith communities in dozens of different ways beyond the traditional notion of membership, often deepening and stepping back over the course of their lives. If we truly believe that everyone in our faith movement matters, whether they are official members or not, it is clear we need to re-conceive what it means to be connected to Unitarian Universalism. We created a spectrum to help congregations see that there are distinct levels of belonging to our faith communities. Together, as leaders in the UU Association of Membership Professionals and as UUA staff working on outreach, we offered a workshop at 2015 General Assembly about how to engage the whole spectrum. These are the people who know us and are in sync with our values, but not involved in our programs or ministries. Some examples would include those who participate in community activities related to a UU group, follow UUs on social media, share UU content, read UU books, see and/or support UU social justice actions. Those who are involved with UU programs or ministries at a basic or fluid level, and may or may not identify as UU, are at this stage. 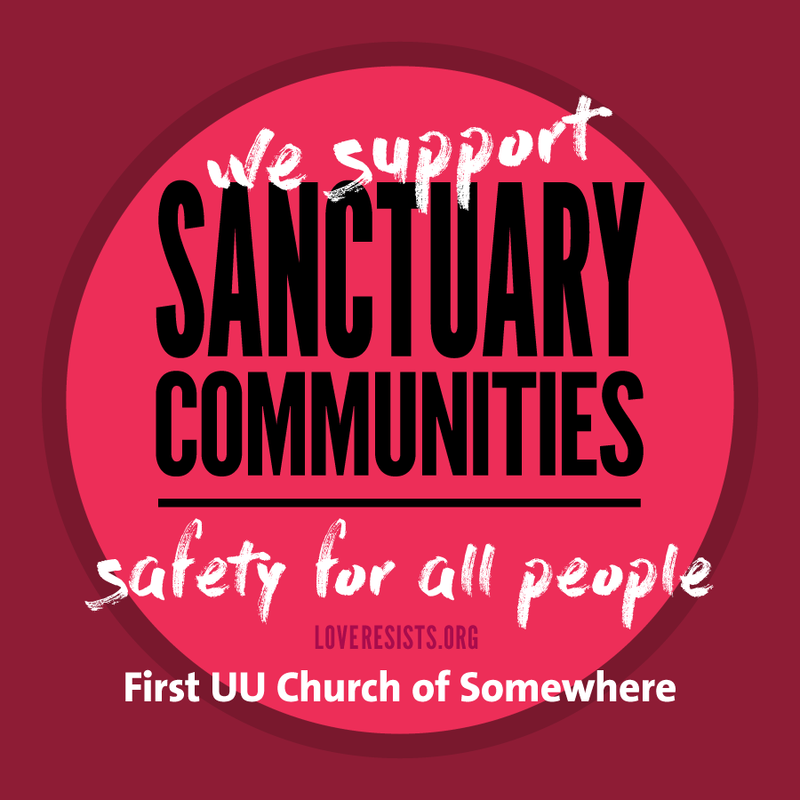 They may attend events hosted by UU congregations, go to Sunday services occasionally or participate in UU community-oriented ministries and programs (e.g. day care, lecture series). Sometimes they have a friend or family member who serves as a tie to the congregation. Pay attention to how you show up virtually (website, social media, Yelp/Google/search functions, news media), so you look as beautiful from the outside as you do from the inside. Create multiple entry points that don’t revolve around Sunday morning (get creative! Get passionate!) AND pay attention to visitor experience at all of these entry points. One transition between welcomed visitor and connected friend is the traditional “pathway to membership,” but support is needed for all transitions. 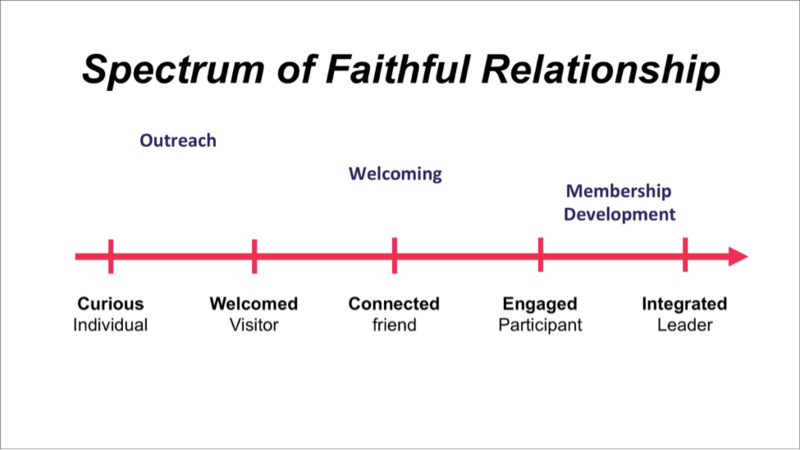 After attending services several times, those who attend a one time or low commitment activity outside of services have become a connected individual. This gives them better opportunities to meet people and start building relationships. Having several easy opportunities, like a Circle Dinner, one time small group, helping set up at an event or serving coffee give new folks a way to meet others without making a big commitment. When a person gets involved in a regular activity, such as an affinity group, small group ministry, religious education teacher or serving on a committee, they have engaged with the community. All of these programs require ownership in one way or another, an expectations of regular participation and, in many cases, opportunities to share spiritual journeys with each other. At the final stage in the spectrum, individuals emerge as leaders. We have found that as someone steps into the role of a leader they are more than simply engaged with a community, but they are also integrated. And by being integrated they are changing the community. They put their own personal twist on the programs they lead and that is a deeper level in involvement then just showing up, even on a regular basis. You become an integrated leader when you are willing to put your efforts into making the community better. Some examples would be a committee chair, small group leader or religious professional. Make sure facilitators and leaders of groups know how to welcome newcomers at each stage as people enter the spectrum at different points. Have training in place for leaders to ensure they have healthy boundaries and motives consistent with the mission of your congregation. Have a tracking system in place to know where people fall on the spectrum. This will be an invaluable resource for recruiting for programs and volunteer opportunities, discovering emerging leaders, as well as those who need assistance in connecting. We need to understand that there will be people who move both directions on the spectrum, and even leave our path. We want to support them in their journey and leave room for them to comfortably return should their path bring them back. Looking at these stages calls us to pay attention to how we help people move from one stage to another. Again, most of us will move up and down the spectrum over time, but transitions between stages will always be important for religious leaders to support (the transition of “bridging” from youth to young adulthood is a great example). We hope this model will inspire UUs to think differently about their faith, from outreach to curious individuals all the way to spiritual enrichment for our integrated leaders. It can even include non-congregational groups, conferences or ministries. Embrace the full spectrum!